Ours is a driven society. We idealize hard work and demonize "laziness." As a culture, we're not big on relaxing. But relaxation is powerful medicine. It's the state in which our bodies take care of business, including the business of healing. On a physical level, it feels great and allows our bodies' natural self-healing and restoration processes to work like they're supposed to. On an energetic level, being relaxed allows our energy fields to shift more easily to a state of healthy balance and flow. It's not that stress is all bad. A moderate, temporary amount can actually be good for you. And as we all know, at least some stress is involved in almost all good outcomes. Think of having children; getting a new job; starting anything new. It seems almost necessary for growth and change. Good stress like this is temporary and manageable. The bad kind of stress feels overwhelming and/or doesn't let up for days, weeks, months, even years. This ongoing, heavy tension is a contributor to many kinds of illness and disease, not to mention mental suffering. Prolonged stress makes you vulnerable to illness and accelerates aging. Over time the stress response can contribute to high blood pressure, heart disease, ulcers, autoimmune diseases, cancer, anxiety, insomnia and depression. Improves ability to handle problems. See what I mean? It's a veritable fountain of youth and health. In my experience, one of the most common and immediately visible effects of energy healing—any kind—is relaxation. 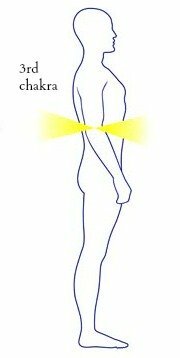 You usually can hear your client's breathing slow down, maybe hear them sigh as they let go of tension, watch their face smooth out. 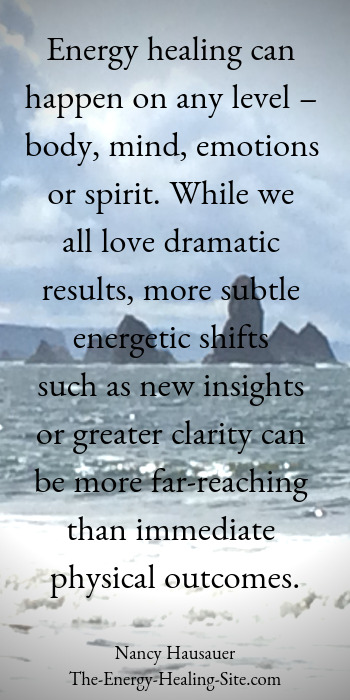 Sessions in which dramatic insights or shifts happen are exciting and rewarding. But if relaxation is "all" that obviously happens in a session, believe me, you've done good work. It means you've helped your client's energy field become more fluid, smoother, more harmonious, more flowing. It means you've helped them get into a state where they can heal themselves. And that is ultimately what we are trying to do. Comment on my Facebook page. Chronic pain relief can be elusive to scientists and sufferers alike. I think it's because they're looking for solutions in the wrong place—in the physical body. Author/teacher Esther Hicks says: "Your body is a pure reflection of the balance of the thoughts that you think." In my practice, I find this is often true. Take the example of someone with chronic muscle pain from an injury that happened years ago. 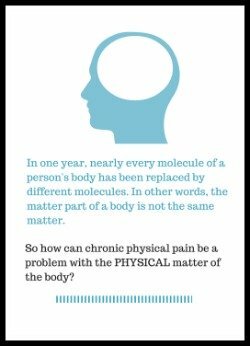 So to deal with chronic physical suffering, it may not be enough to work on a physical level (although that can be a necessary part of the puzzle, of course). For lasting resolution, you may also have to take a more holistic approach. and mobilizing the astonishing potential of your breath. 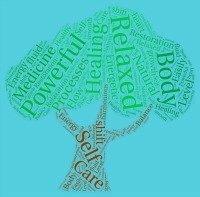 These are all wonderful holistic medicine tools for family health care. Again, you'll find all this on this page on The Energy Healing Site. Physical and mental/emotional symptoms of distress are -- distressing. Illness, pain, anxiety, depression. When we have them, we want to fix them, fast. We don't normally stop to think about their "value." That's natural, a biological instinct. But sometimes we're called to take a deeper look. Maybe it's because we're in a profession that deals with other peoples' symptoms of distress, day in and day out. Or maybe it's because we ourselves have to deal with a chronic ailment -- our own suffering or that of someone we love. In any case, sometimes circumstances push us into questioning the deeper WHY of physical/emotional ailments, turning our usual approach on its head and looking for possible usefulness or value in them. ...The symptoms of illness often can be seen as signals for attention or ways of making us aware of needs that are not being met. Thus if we learn to pay attention to our body's signals or symptoms in a certain way, we can actually learn something from an illness that helps to bring us back into alignment with our potential for wellness. 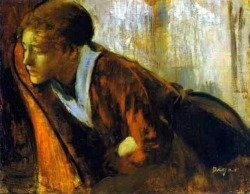 Viewing illness as opportunity to realign with our purpose in life, our life-path -- that's so much more empowering than the conventional medical model's approach. Of course, we don't want to court illness or suffering as a source of wisdom, and of course we do want to use what conventional medicine has to offer. But if life presents us with a potential path back to wholeness and balance -- why on earth not take it? Why would we NOT explore an opportunity to "realign with the flow of energy in accordance with our purpose"? Comment or share on my Facebook page. Energy healing can help us break out of the too-small energetic containers that most of us confine ourselves in. 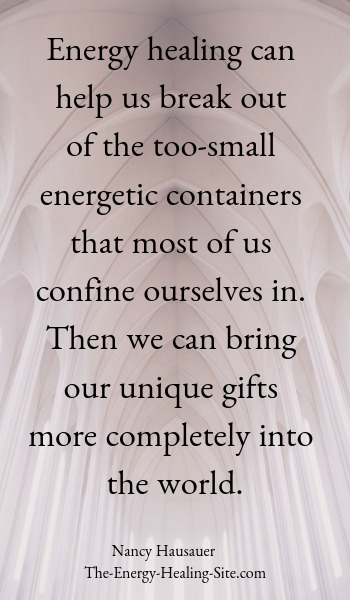 Then we can bring our unique gifts more completely into the world. 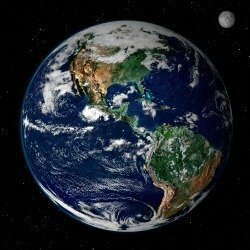 March 20 is the Equinox, Spring in the Northern Hemisphere and Fall in the Southern. On the Equinoxes, day and night, light and dark, are equal. They're moments of balance. I like to imagine them as single instants when we're poised, motionless, in absolute peace. As with each of the great annual solar events, the equinoxes offer us wisdom and an opportunity for healing. In particular, they are celestial reminders to pause in our lives and take time for reflection. This Vernal Equinox, I offer the following as something to reflect upon. DO NOT READ AHEAD! 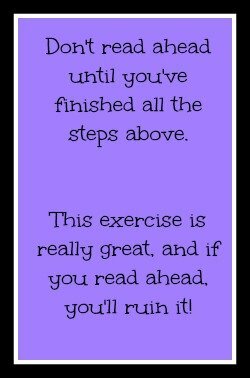 It spoils the exercise. Get two sheets of paper and a pencil. On one page, list 10 people you admire, heroes living or dead, people famous or familiar. Leave some space under each name. Under each person, List 5 or 6 (or more) traits or qualities that you especially admire or honor about them. Really give your best effort to articulating particular characteristics you admire about them. It's OK if there's repetition; you don't have to list unique traits for each one. When you're done, read through all the traits of all the people. Adjust as needed. Then circle any characteristics that show up more than once on the page. Now take the second piece of paper. Draw a heavy line three inches down from the top. Below this line, list all the characteristics/traits you circled. Re-read the traits/characteristics you've listed there. Re-read several times. Let them sink in. This is you. This exercise works because you admire traits in other people that resonate with you. They resonate with you because you already possess those traits. It's like a tuning fork. Remember: This is a portrait of you. Sit with it for a while. Absorb it. Contemplate it. Breathe it in. Accept it. It can be hard to believe that you are all that. But it's true. You really are all that. As the saying goes, "You are the one you have been waiting for." Your job: to let it flower. As an energy healer, it's likely that you will see people who are suffering from depression. It's one of those difficult, stubborn issues that can sometimes be hard for conventional treatments to address--so some sufferers start looking for alternatives, including energy healing. While often depression is mild, when it's major it's a serious illness that can have life-threatening consequences. It can affect health in lots of ways, including driving people to attempt suicide. And sadly, suicide is on the rise in the U.S., as reported in this article from the Washington Post. It's important for anyone who may be in a helping role for people who are depressed to know the hallmarks of depression and the signs that someone may be at risk for suicide. Here's a link to an NIMH page that summarizes the symptoms of major depression. Here you'll find signs that signal that someone may be intending suicide. Beyond knowing these signs and symptoms, if you deal with people who are depressed, you'll need an action plan, including a list of local mental health referrals. Our role as energy healers should be to complement and support the work of trained psychological professionals. Make sure depressed clients are working with appropriate, qualified mental health professionals. ** things NOT to say to people suffering from depression. ** and a link to a useful PDF that summarizes a lot of this. I know this isn't a fun topic, but sometimes we energy healers do deal with serious illnesses, and we need to be responsible by being informed, prepared and staying within our scope of practice. Continue reading this new page on The Energy Healing Site. Do you ever just put up with stuff that irritates you? Little annoyances that don't quite fully rise to the level of awareness, or seem too small to make it onto your to-do list? Yup. Me too. They may be little, but they add up. They're like small, slow leaks in a tire. Not emergencies, but eventually that tire is going to get flatter and flatter. And that's the way these annoyances affect your energy. They create slow, small leaks in your field. They also impact your third chakra, the seat of your personal power, because they undermine that power. By putting up with things, you're not exercising your sovereignty over your own life--and things that aren't exercised get weak. So, not addressing annoyances in our lives diminishes our energy in (at least) two ways. But it's so easy, and satisfying, to fix them. Below is an exercise specifically to do that. 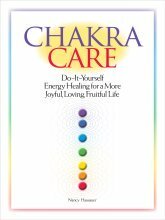 Before you start, set an intention to strengthen and support your third chakra and close leaks in your energy field. This will amplify the power of the exercise. Keep a little journal or your phone handy. For a couple of days, as you go about your normal life, make notes about small things that bother you. The messy drawer, the squeaky hinge, the jagged fingernail, the pile of papers needing to be filed, the commitment you agreed to when you knew you didn't really have time for it. After a couple of days, transfer these notes to a hard-copy list that you can post somewhere in your house. If you're like most people, some of the items on your list will be very easy to deal with, while some will take a bit more planning and effort. When you've taken care of an annoyance, stop to enjoy how it feels not to have that pesky situation in your life. Let yourself bask in the feelings of accomplishment and empowerment. By the time you've ticked off everything on your list, you'll be in the habit of noticing small annoyances and taking care of them regularly. You'll also be building your power muscles so you'll be better able to address the larger discontents in your life. On an energetic level, all of this will help your energy field be able to recharge itself and hold that charge. Your third chakra, which thrives on making things happen, will also love it. It's getting to be that time of year: Spring Cleaning time. 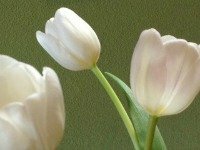 Why is spring cleaning (or any major clearing of your home) energetically important? 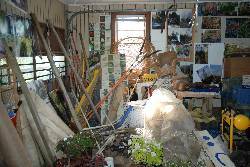 As life coach Martha Beck says, "Our living spaces are basically three-dimensional portraits of our inner lives. You can't de-clutter your living space without de-cluttering your inner life and vice versa." Hmmm. . . Take a walk through your house. What do you see? How does each room feel? When you come home, what's your general feeling? Do you feel peaceful or agitated when you walk through the door? Does spending time at home make you feel energized or lethargic? Clear or foggy? Cheerful or downcast? You can use the act of spring cleaning intentionally, to help clean up your energy system, open chakras and support energetic balance and flow. A good cleaning and decluttering can really shift your energy. And the other way around, if you notice an irresistible urge to clean and declutter, it's usually a sign that your internal energy is in the process of shifting. You don't have to undertake a whole-house-cleaning, if you don't want to. You can shift a lot of energy just by tackling one room or even one cupboard or drawer. Or if you're really strapped for time, just clear a single surface, such as a table or shelf, and create an altar or other eye-resting, eye-pleasing spot. This could be as simple as a vase of flowers placed with intention on your cleared surface. It'll help bring more coherence, harmony and order both to your home and your personal energy system. This is a good example of how you can use any intentionally done activity, no matter how mundane, to heal and support your energy. Everything is energy, everything is connected and intention is a powerful force. So happy cleaning! Our culture teaches us that we are basically nothing more than matter, just glorified machines. This falsehood about our true nature, about the reality of what we are, is deeply wounding and the cause of great suffering. Energy healing can help heal that terrible misperception by giving people a direct experience of their true, non-material nature.